Yafa Hummus FREE Bowl of Lentil Soup to support the Tracy Boys and Girls Club! Join Yafa Hummus all day on November 9th for a FREE bowl of Lentil Soup! 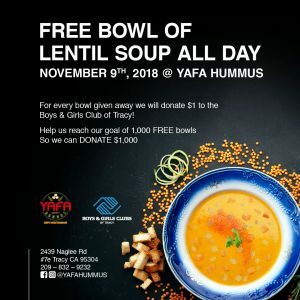 For every bowl given away Yafa Hummus will donate $1 to the Tracy Boys and Girls Club! Help them reach their goal of 1000 bowls given away so they can donate $1000!! !